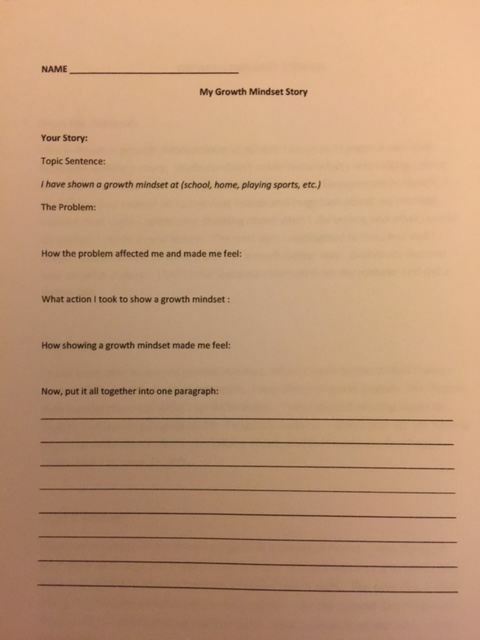 I’ve done a variety of different types of lessons over the years about a growth mindset, and you can see most of them at The Best Resources On Helping Our Students Develop A “Growth Mindset” – along with a ton of other related resources. The one I did today, though, was probably the best one yet. Our school emphasizes Social Emotional Learning, and a growth mindset is our focus for September. A number of us are responsible for giving formal SEL lessons to our classes, while other teachers are provided with professional development about how to support it in their classes. Today, I did the lesson with my English Language Learner United States History class. Truth-be-told, I was probably a bit more motivated than usual to do something new and creative for two reasons – one, because, even though the lesson I had done for the past two years was a good one, I a bit tired of it and, two, members of the California State Board of Education were coming in to observe it. I then showed each of these three video clips (which I’ve used in prior lessons). After each one, I had student think for a moment about what the video clip might be saying about what a growth mindset meant. Students shared with a partner, and then I called on students to share with the entire class. Below the clips, I’ve included a picture of the easel paper showing what students came up with…. I then distributed, and read aloud, these three stories showing a growth mindset. I explained that as I read them, students should be thinking of their own examples since they would be writing them next. You can download it here. Next, I gave students this writing frame (you can download it here). 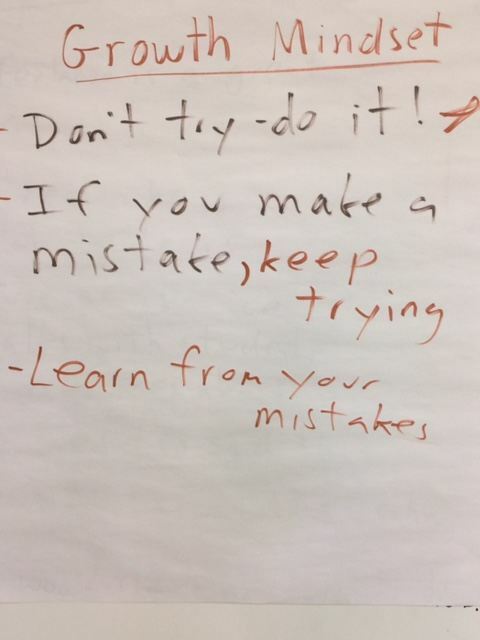 I asked them to think about what we wrote on the easel paper about the elements of a growth mindset, and try to remember a time when they acted like that. We went through each section one-at-a-time, and then students copied them down into a paragraph. Everyone was very engaged. Almost everyone finished their story (many, though not all, were about learning English). Tomorrow, students will be sharing them with each other and, eventually, posting them on our class blog. The sharing should be a good community-building experience. 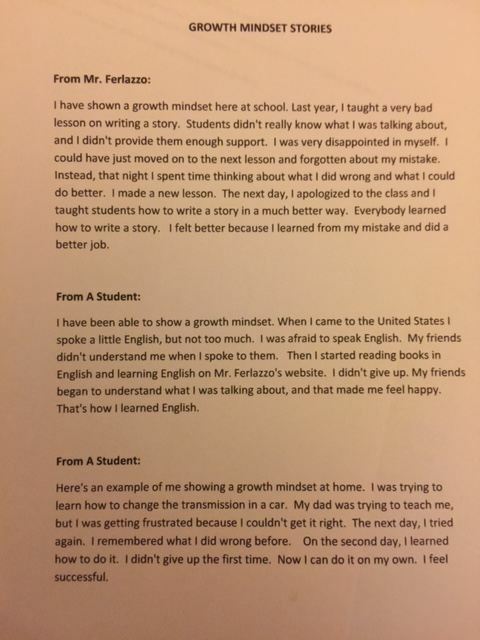 In addition, we now have a common growth mindset vocabulary which enables me to not have to say, “Jose, please put your head up.” Instead, I will be able to say, “Jose, remember our growth mindset lesson?” That should help students, and will be much more energizing for me, too!